Being the biggest iPhone to date, the iPhone 6 Plus is more susceptible to damage, especially in the instance when it’s accidentally dropped from a height. Metal coming into contact with the hard pavement is tough to envision, but we certainly know the gut-wrenching feeling that comes after if something catastrophic like that indeed happens. Otterbox’s Defender Series has a reputation of being an impervious thing, one that’s built like a tank – so it’s fitting for us to see how it handles the iPhone 6 Plus. Not surprisingly, the Otterbox Defender Series Case for the iPhone 6 Plus follows in the same tradition that many are familiar with at this point. It’s undoubtedly not trying to win style points with its straightforward, militaristic design. However, the company now allows buyers to customize the color scheme of the case – where a total of 25 combinations can be made. Naturally, the Defender Series Case adds a considerable amount of girth to the phone. Gone is the svelte profile of the iPhone 6 Plus, replaced instead with a substantially thicker chassis. The immense size of the case, of course, provides it with substantially more protection than other cases. Everything about the phone is protected from the elements, including the screen because there’s a built-in screen protector that covers the display – as well as a thin protective membrane that shields the Touch ID sensor to permit us to continue using it. As for the rest of the case, there’s a tough polycarbonate plastic shell that covers the entire phone, while a rubbery outer synthetic slipcover wraps around everything to absorb shocks due to drops. And finally, it comes included with a belt clip holster that swivels too! 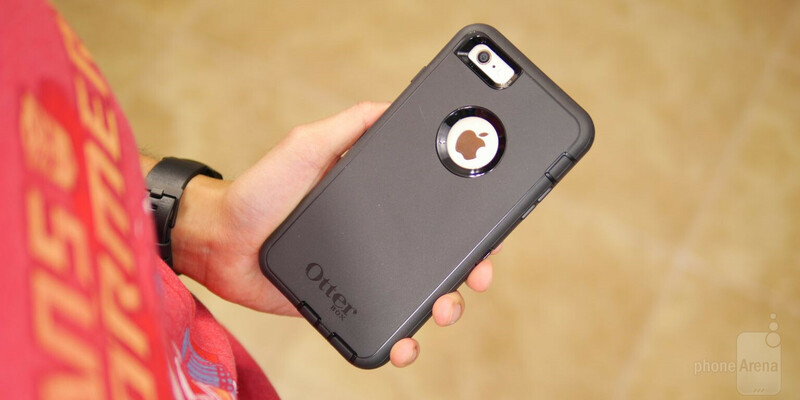 Where it sports a generic and bland design, the Otterbox Defender Series Case for the iPhone 6 Plus makes it up with is renowned protection – one that protects the prized phone from the most serious of drops. From a height of 4 feet, the phone is safely guarded against the impact onto concrete. Even though the case exhibits and absorbs most of the bumps, bruises, and scratches, the phone itself is intact and blemish free. Having that reputation of being a supremely solid case, its $69.90 cost isn’t too surprising for those familiar with Otterbox’s legendary protection. Indeed, it’s an expensive price to dish out for something that doesn’t look all that appealing, but its main intent is to guard the phone from damage – giving owners peace of mind that it’ll be protected just fine. Yes, that’s exactly what it does in the end. I paid $74 after taxes for mine and sending it right back. The gap between the screen and the protector is totally unacceptable. My good that looks odd and akward clipped on. The Otterbox Defender I had for the iPhone 6 was terrible. The port and speaker openings were misaligned; The rubber covers for the Lightning and head phone jacks were misaligned; The volume and on/off switch buttons had to be pressed hard to actuate. The screen protector is a joke, I removed it; The plastic bezel of the front cover interferes with the touch screen operation. It was difficult to move App icons from screen to screen and to get the Control Panel to swipe up from the bottom. I found that your finger has to make contact with both the screen and the phone's bezel to get the swipe actions to function. I noticed this on a 5S as well. I would up returning the case and the iPhone 6 after 10 days and have an S5 now. This is a terrible product. It left a permanent mark on the glass surrounding the home button of my iphone 6 Plus. The mark is the exact same shape and size of the membrane that is designed to protect the home button. You won't notice this until the day you decide to use the phone without the case and clean the phone. Utter garbage, and expensive too. I will never buy Otterbox again. With all that being said, check out the Bandshell iPhone amplification case for the iPhone 5/5S, 5C, 6 and 6 plus. They will be shown at CES next week in booth 5939. Amplifies your iPhone seaker 2X while offering an integrated kickstand, extremely durable while maintaining the sleek profile of the iPhone. If you want the best protection from drops and scratches, this would be the perfect case for you. After 3 days of using this awesome otterbox defender case, there were few things that made me hate the case. The buttons were too hard to press, you have to put a lot of pressure on the power & volume buttons. Next, the built in screen protector was so annoying because the phone's touch screen functionality decreases drastically so i decided just take it out. Lastly the phone doesn't really sit properly inside the plastic shield, so it moves inside in a generous amount of space. I decided to call their customer service hotline to raise the issue, but i was hesitant because i bought the case in UAE. I thought i am not eligible of getting a replacement because i'm not in the US. The conversation went so easy, they just asked for the serial number(the small white sticker with letters & numbers inside the plastice shield, so don't take it out and throw) they took my address and contact number, told me i'll get a replacement in 8-12days. In just 4 days i received the replacement in a fedex package. They sent both the plastic shield and the rubber case. This case was perfect. Buttons are so easy to press, the phone fits perfectly inside the plastic shield and the built in screen protector works perfect as well. So if you guys have problems with your otterbox cases, otterbox has excellent customer service to help you get the right protection you need for your phone. Thanks to their customer service agents namely Maddie and Debbie, they were so friendly and very helpful. I purchased the Defender case for my IPhone 6S Plus and it is horrible. the gap between the screen and the otterboxbox protector makes it very difficult to use. I have used otterbox products in the past and found them to be above and beyond what I expected. However, the defender case DOES NOT fit the 6S plus phone correctly. Don't waste your money unless you are looking for a lot of frustration.